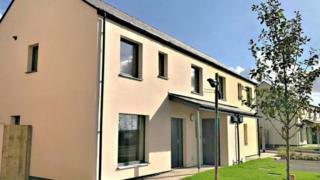 Plans to build 170 new council homes have been announced by Denbighshire council. The authority, which already provides more than 3,400 council homes, said more were needed to meet local needs. There are an extra 5,000 tenants in the county using social housing provided by groups like housing associations, said a spokesman. Meanwhile, tenants have moved into the first "council homes in a generation" with 18 properties built in Swansea. The Welsh Government wants 20,000 new affordable homes in Wales by 2021. Other local authorities have also been building new council homes with 200 under way in Flintshire and plans for 600 in Cardiff over the next 10 years. Carmarthenshire council has vowed to provide over 1,000 "affordable homes" by 2021 with three sites earmarked for new-build council homes. Some Welsh councils have deals with housing associations and developers to build social housing in their areas. Denbighshire council said it also wanted to work with private owners of empty homes to "bring them back to the market" as part of its £18m plans.